Are these suggestions for where to change depending on the direction you're going + changing to? Or do they have some other meaning? Bonus marks - Assuming I am right that that these are direction interchange suggestions, what does it mean if it's an empty circle, or a "T" in one? Yes, they are interchange recommendations. The easiest and most important rule is that if the line doesn't go into the circle, it doesn't stop there (for example the Airport Express in Sunny Bay). The parenthesis-shaped symbol in Yau Tong conveys that there is a same-platform interchange between Tseung Kwan O (purple) eastbound and Kwun Tong (green) westbound, and between Tseung Kwan O westbound and Kwun Tong eastbound. Thus it is a good place to change when going from Lam Tin to North Point or vice versa. In Tiu Keng Leng, the same-platform interchange is between the westbound or eastbound directions of both lines, so it's a good place to change when going from Tseung Kwan O to Lam Tin or North Point or vice versa. In Tsing Yi, there is no same-platform interchange. In Sunny Bay, Disneyland Resort Line trains stop on a single platform, with Tung Chung Line westbound on the opposite side. You need to change platforms to reach Tung Chung Line eastbound. Since this is the only way to change between these two lines anyway, the map contains a symmetrical symbol. “When you live in HK (…) it becomes common knowledge”. Not the answer you're looking for? Browse other questions tagged public-transport maps hong-kong or ask your own question. 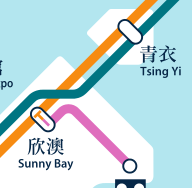 What do the interconnection symbols mean on the MTR (subway) map in Hong Kong?